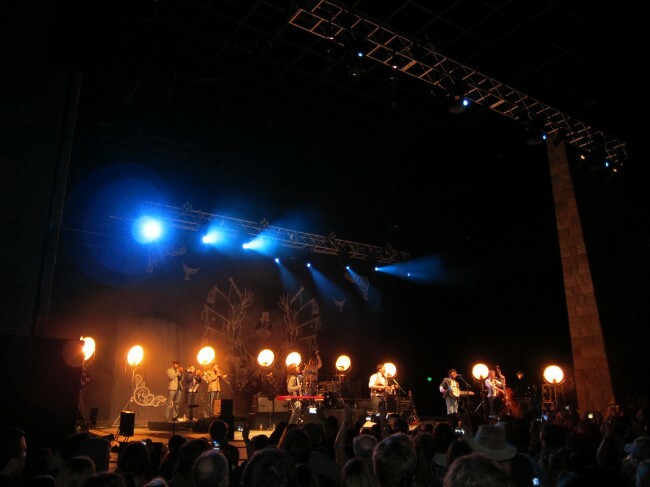 The great young British band, Mumford and Sons, came to the sanctuary of the hallowed Santa Barbara Bowl last night and tantalized the crowd with its tent show revival. They played with infectious joy and it wasn’t long before that fecund rapture raised the crowd right out of their seats. The band was in constant movement and played as if end times were upon us. 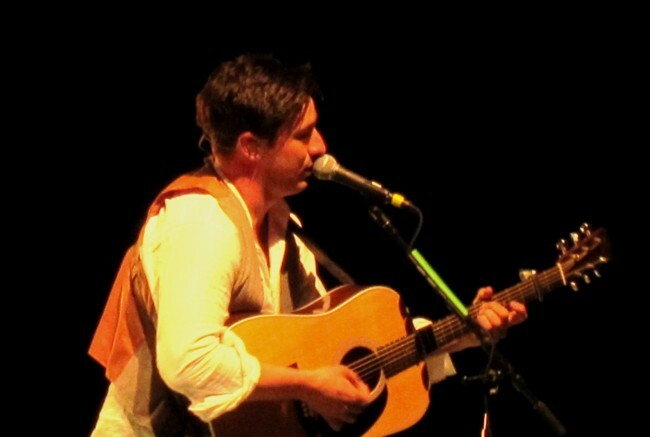 Though there was only occasional drumming (several times played well by leader, Marcus Mumford, as seen below on Lover of the Light), the band pounded out a relentless beat interspersed with dynamic downshifts, only to shift back up to stomp-down. 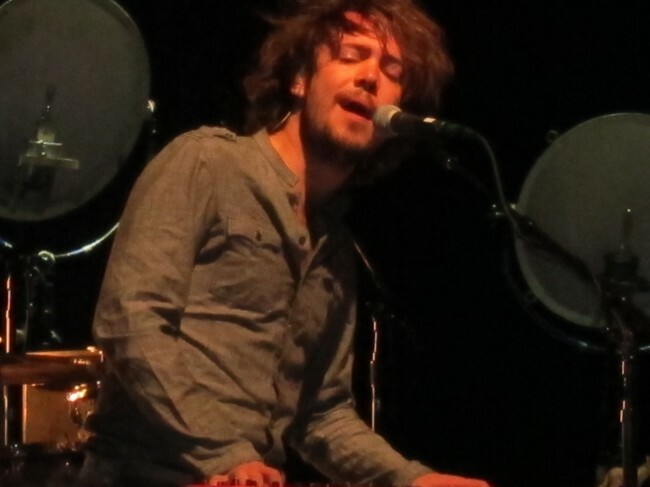 Winston Marshall banged and body-rolled his banjo, Ted Dwayne beat up the bottom end on bass, the three-horns hectored, and Ben Lovett played the keys with flair and an unflappable smile. 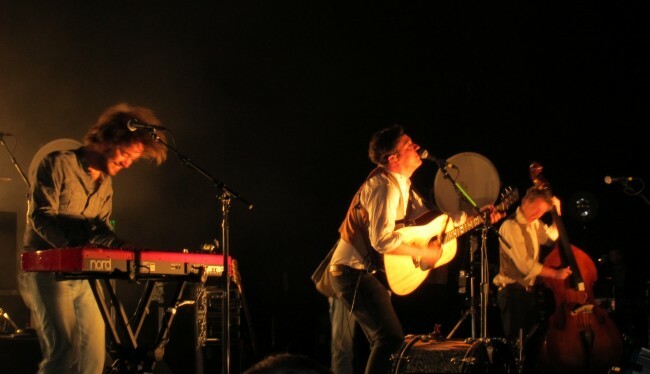 But if there’s one image that captures the Mumford experience, it’s of Marcus strumming his guitar at the speed of sound to propel the proceedings. It brings the house down every time. The band repeatedly lauded the Santa Barbara Bowl and Santa Barbara, and they’ll be back. Don’t miss it next time. Below is the long setlist (they claimed their longest ever), which included a bunch of new songs and an Old Crow Medicine Show cover. If you weren’t there, below is a good sample of the Mumfords live from Coachella on Saturday. 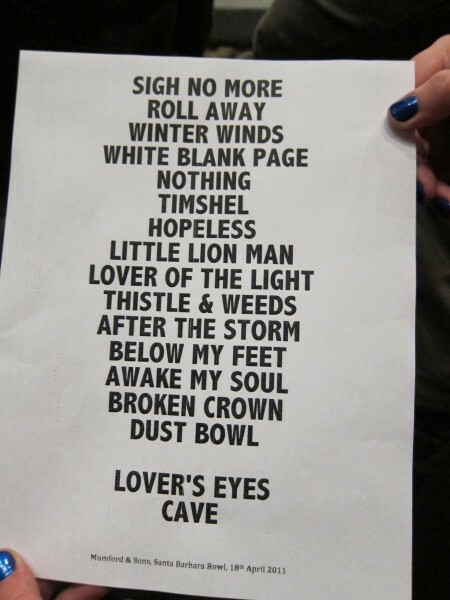 Check out Little Lion Man, The Cave (typical set closer), and great new song Lover of the Light. As for The Tallest Dylan Impersonator we’ll have to admit that he presents himself better live than on record. 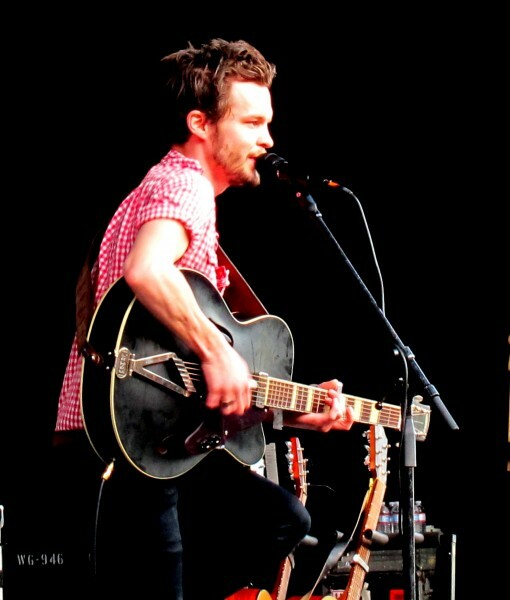 He’s a very adept finger-picking guitar player and has some interesting things to sing. And he covered John Hartford’s oft-covered (most famously by Glen Campbell) chestnut, Gentle on My Mind. We just wish we hadn’t heard it all before by the master himself. TMOE should invite that stellar female harmonist on stage more often. With some added elements and some Dylan-downplay he could grow a bit. Finally, we admit that we were one-upped last night by a couple of enterprising lasses (Hannah and Chloe) who, at the end of the Mumfords last song, literally ran to their car and (carefully) raced out to UCSB to catch Ellie Goulding’s show at the UCenn. Rave reviews followed. Hats off on the Double.